Sóna, what also helps is if you float a small ball in your bird bath. 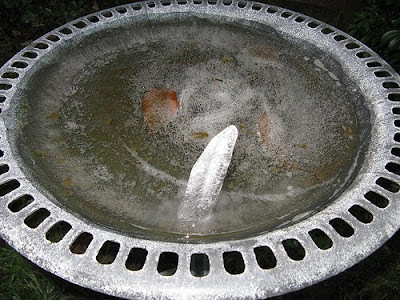 The wind pushes it around the surface making it less likely to freeze over. We have a table tennis ball in our small one, but a tennis ball would do just as well. 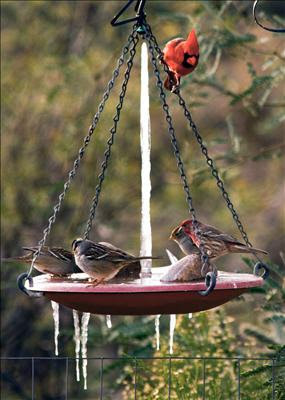 Is that a cardinal on the hanging water bowl? How on earth did s/he get to Hackney Wick? Just to add, the frost season isn't over, so the birds are still going to appreciate the drinkable water people put out for them even though the worst of the Big Freeze seems to be past.